Note: This is provided through a connection that one of our Executive Members has with the organization that has provided the following information . It is suggested you make a contact with any veteran that you know who may qualify. Many of you have likely received this through other channels (Veterans Affairs, the Legion and many retiree associations), but I would like to ensure that we reach the widest possible audience. On June 6, 2014, Canada will mark the 70th anniversary of D-Day and the Battle of Normandy. Many activities will take place to honour those who lost their lives in the service of Canada and to preserve the memory of their sacrifices and achievements. The Government of France would like to pay special tribute to Canadian veterans who were part of that campaign by appointing them to the Legion of Honour, the highest honour conferred by the Government of France. The Department of Veterans Affairs has agreed to support this initiative, and we encourage you to participate by nominating candidates for this prestigious decoration. The Embassy of France is looking for candidates who took part in the battles and military operations surrounding the landings and the campaign to liberate France between June 6 and Aug. 31, 1944. The decorations will be awarded in recognition of outstanding achievements in military or civilian life. The Government of France has announced that it wishes to recognize surviving Canadian veterans who participated in the Liberation of France by awarding them the Legion of Honour. Unfortunately the nominations are due by 31 December. Eligible people are requested to complete the attached form and submit it to the address indicated on the form by the end of this month. Request that all give this the widest possible dissemination to eligible retired members of the RCAF, RCN and Army. The objective here is to ensure we don`t miss any of our cherished heroes. The Canadian Veterans Advocacy (CVA) uses the term Sacred Obligation when speaking to or describing the Government of Canada's responsibilities to Canada’s Sons and Daughters who have been wounded or injured as a consequence of their service at home and abroad. I am often asked, what is the definition of the Sacred Obligation? In the context of military service, "Sacred " is a very special connotation and predicates great level respect for the living, life time sacrifice of the wounded and those who have offered the ultimate sacrifice on behalf of the nation. Legislatively, the Sacred Obligation was first defined by Sir Robert Borden through special provisions in the Pension Act, acknowledged the life time of pain and suffering Canadian disabled veterans experienced after returning from the battles of Passchendaele, Amiens, and Vimy Ridge. The standard of respect has been perpetuated and enhanced by successive Canadian parliament’s who understood the uniqueness, the ultra-dangerous environment and patriotic sacrifice of those who have sworn allegiance to the Canada and the impact this sacrifice has borne upon their families. When a Canadian Citizen takes the Oath of Allegiance/Affirmation when joining the Canadian Armed Forces, it is implicitly understood that the threshold from the comfort Canadian civilian society has been crossed and they have pledged their lives to defend the principles upon this great nation has been founded. The Oath that the 18 year-old CAF recruit swears to is very similar to those taken by the Prime Minister of Canada, Parliamentarians, Senators and Chief Justices of the Supreme Court of Canada; indeed, this places those that serve this nation in some very prestigious company! Unlimited Liability aka, the Sacred Obligation. Unlimited Liability/Sacred Obligation is the ultimate demonstration of trust between nation and those they would send to war/peace, a concord underwritten in blood inclusive of ultimate sacrifice, so willingly volunteered in-trust to the People of Canada. Unlimited Liability and the Sacred Obligation extends to the soldiers family; their mother, father, husband, wife, children, all acutely aware of the consequences national service entails, all who share concern for the their loved ones during service and beyond when they have been released to our communities due to wounds or injuries. The people entrusted with upholding the Sacred Obligation, those who bear the solemn authority to put the soldier in Harms' Way, serve the nation as our parliamentarians. Since World War 1, Canadians have deployed many times into the vortex of violence, tens-of-thousands of valiant men and women sacrificed their lives for the nation and many, many more were wounded or injured. They, as did those who deployed to Afghanistan, served this nation with the implicit recognition of the Sacred Obligation should they be injured or for their dependents if they die in the service of Canada. The Sacred Obligation has been embraced by successive governments since WW1 until, in 2006, the Harper Government implemented the New Veterans Charter (NVC) and in doing so, abandoned its Sacred Obligation to those who would serve at a time when Canada’s military would, for the first time since the historic battles of Korea, be called to war. 150 valiant Canadian men and women have paid the ultimate sacrifice since 2006, over fifteen hundred have been wounded during Prime Minister Harper’s stewardship of the war. How does one define the Sacred Obligation to the wounded, to the mothers, fathers, widows and children of the fallen, those who have been awarded the Memorial Cross in recognition of their sacrifice? Just how does the New Veterans Charter discriminate against those who serve today, those who have sacrificed limbs, minds and souls to the nation? How do we measure ones level of sacrifice on a pain and suffering perspective, just how worthy is the traumatic amputation of a leg/s, an arm/s, a mind when the Sacred Obligation, established through decades of parliamentary respect, has been abandoned at a time of war? The answer is clear, precedence has been set. Let us compare Major Ortona, who is catastrophically injured in Italy, 1943 and Major Khandahar, who suffered the same, life altering injuries when struck down in battle at the height of Operation Medusa in Southern Afghanistan, 2006. Both men suffer explosive amputation of their legs, severe internal wounds including the loss of their testicles, significant hearing loss-tinitus, brain system injuries and, as a consequence of their ordeal, severe PTSD and depression. Major Ortona is medically released and returns to his wife and two young children. He lives for sixty years but requires long tern care at Sunnybrook Veterans hospital during the last fifteen due to his injuries and his wife’s inability to provide home care. The nation recognized the life of suffering Major Ortona endured and fulfilled its Sacred Obligation to him and his family until death and beyond. Special Pain and Suffering provisions within the Pension Act accorded Major Ortona a monthly pension unto0 death. A supplementary pension was also accorded to his wife with the recognition of her sacrifice and the impact of providing care to double amputee with mental issues bears upon her life and future. Small pensions were provided to Major Ortona’s two children and, when they sought higher education, financial assistance was available. When his wife could no longer care for him, Veterans Affairs Canada ensured he had a room at Sunnybrook Veterans Hospital, where he would life out his days in comfort and with the level of dedicated care required. When Major Ortona preceded his wife, his widow was accorded half his VAC pension and eligibility to VIP services. Over the course of his life, Major Ortona would be provided close to two million dollars, tax free, in recognition of the life time of pain and suffering he had endured. Major Khandahar sustained the same catastrophic injuries. The Sacred Obligation, now abandoned, does not include the life time financial security inherent with the Pension Act monthly provisions, instead, he is awarded a lump sum award of 250 thousand dollars. By the time he retires, moves, buys/modifies a home and the family adjusts to his physical and mental disabilities, there is little left. His wife, who fears for his life –suicide- and must stay home is not, as was Major Ortona’s wife, provided a small pension in recognition of her sacrifice. Nor, when Major Ortona precedes her, will there be any pension to share of VIP services to ease her financial burden during her twilight years. The disparity in respect between the services provided when the Sacred Obligation was embraced and the standard applied to today’s modern war wounded through the New Veterans Charter can only be described as obscene; to accord one standard of service of a veteran of one war yet not another is a glaring demonstration of the repercussions to Canada's wounded when a government looses its moral compass and abandons the Sacred Obligation to those they have sent to war. The Canadian Veterans Advocacy does not dispute that there are positive qualities within the New Veterans Charter and/or Bill C-55, indeed, the harmonization approach that we have submitted reflects the need of incorporating the positive benefits of both programs into one effective mechanism capable of serving veterans of all eras equally and without discrimination. The disparity of the Lump Sum Award provisions when compared to the Fulfillment of the Sacred Obligation via the Pension Act, while not the singular issue in requirement of redress, must be a priority. The nation’s obligation to Canada’s most seriously wounded veterans, referenced by Veterans Ombudsman Parent’s last report, is not being fulfilled, as such, our duty, our Sacred Obligation, is clear. We must unite behind the wounded who, having no recourse or support from the traditional veterans organizations, have resorted to the courts to seek justice. What do they seek? They seek the same standard of respect that Major Ortona, myself and thousands of Canadian veterans have been accorded for pain and suffering as a consequence of our service. They seek only fulfillment of the Sacred Obligation they believed to exist when they were wounded, no more, no less. No other option is acceptable! Veterans organizations that do not support this position (Equitas), particularly formal stakeholders such as the Royal Canadian Legion and major organizations represented through the Legion's Veterans Consultation Group have not embraced the Sacred Obligation and are championing meager enhancements to the Lump Sum Award to a comparable level that someone injured on the job in Ontario would receive. This position does not reflect or respect the sacrifice of our Afghanistan War wounded or the very pillars on which the Royal Canadian Legion has been built. The standard of care they have fought so hard, through multiple generations of Legion leadership, to ensure the obligation was met and provided to World War 2 and Korean War veterans, is not being accorded to those who fight today. The wounded, abandoned by government and veterans stakeholders alike, have united and with no other alternative, have been forced to seek redress through the courts. Their quest directly addresses the Harper Government’s abeyance of the Sacred Obligation, an obligation this nation stood proudly behind for nearly a century, an obligation negated at the height of the most vicious combat this nation has experienced since the Korean War. Is Major Khandahars’s national sacrifice no less worthy than Major Ortona’s? Did they not both suffer the same catastrophic wounds, traumatic amputation of the legs, testicles, a lifetime of PTSD and depression with all the ugly, soul and family destroying horrors they bring to the veteran and his/her family? I would suggest that their sacrifice on behalf of Canada is equal, that national precedence has been established with the blood, courage and great sacrifice of our forefathers. I would suggest that this is and must be the only standard applied to those who suffer the same consequences of war today. This is the Sacred Obligation. 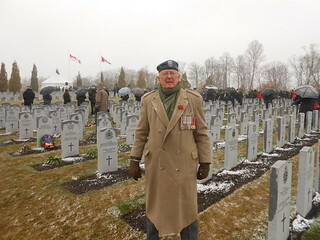 A Sacred Obligation the Canadian Veterans Advocacy has been founded to restore. CTV Interview, OVO Report, We will fight! In 2001, Beechwood became the home of the National Military Cemetery of the Canadian Forces. Section 103 is dedicated to honouring the memory of Canadian service personnel who faithfully served their country in war and peace, at home and abroad, sometimes making the supreme sacrifice on its behalf. 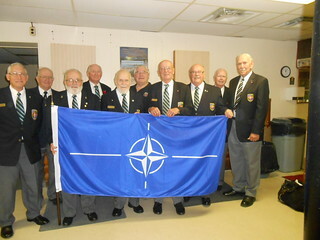 On Saturday,October 19, NVOC held its AGM at Royal Canadian Legion Branch 212 Kemptville On. This was held immediately following the regular monthly meeting of the Ottawa/Gatineau Unit. Details of the AGM will be posted. Tud Kaulback--National Advocacy Chairman. chairman external ops. This report is a follow-up to the review paper, released on April 4, 2013, and is the culmination of an extensive research effort and Canada-wide consultation with Veterans and Veterans' organizations. The Actuarial Analysis provides detailed demographic and financial data about the current effects of the financial programs that support Veterans. Why Conduct an Actuarial Analysis? Free B&B Accommodations on Remembrance Day to Honour Vets and Military Personnel! Hundreds of bed and breakfast throughout Canada and the U.S. will be honouring veterans and military personnel with a free night's accommodation on Remembrance Day. In a campaign called B & Bs for Vets, B&B owners will be opening their doors with complimentary stays for the night of Sunday November 11, 2013. After a wonderful night's sleep, the guests will be served a delicious breakfast prepared by their host(s). Canadian B&B owners are thrilled that they can participate in this campaign. It's their way to recognize and thank all those who have dedicated their lives to serving our country. Veterans and military personnel who are interested in reserving a free night's accommodation for November 11, 2013 should contact the B & B directly. Visit BBCanada.com B&Bs for Vets 2013 to see a complete list of participating Canadian B & Bs and contact details. Please note that military identification is required. Professor Paul Robinson of the University of Ottawa commented in the Ottawa Citizen op-ed page on August 5th on the validity of veterans’ claims for support in a class action law suit brought forward by some veterans in the case heard in Vancouver during the last week of July. In their suit, the veterans argue that the Veterans Charter violates the Charter of Rights. The veterans claim that the Honour of the Crown imposes an obligation on the federal government towards ex-service men and women which goes beyond what is in the Veterans Charter. Professor Robinson seems to support the view of the Government of Canada lawyer who the professor says claimed that the suit should be dismissed, claiming that the Government does not in fact have any extraordinary obligation towards veterans. Obviously, Government policy has changed with the lawyer's statement and a great many veterans feel that they have been abandoned. Internet e-mails that some of us see daily are seething with anger. Veterans whose physical and mental capacities changed as a result of their service need continued Government support. The shortcomings of the New Veterans Charter (NVC) have been brought to the attention of the Government on numerous occasions by a variety of veteran organizations especially by those veteran organizations that have a charter and which have been invited to speak before the Parliamentary Standing Committee on Veterans Affairs. Had any of the recommendations been acted upon this whole mess including the class action law suit would likely have been avoided. Professor Robinson raises the issue that serving members of the CAF and veterans are and/or were volunteers and that this makes it difficult to claim that the state has an additional obligation to provide special benefits on demand. If I were a student of Professor Robinson I would tell him that he has no idea what he is talking about. I would point out to him that from recruit training onward members of the CAF are imbued with the concept that their service has an unlimited liability to serve anywhere, under any circumstances regardless of the inherent danger notwithstanding Canada Labour Codes. We veterans all took an oath to the Sovereign; the same oath that everyone else takes. However, the expectation was always that having gone into harms’ way the Sovereign would care for those of us who were injured and that we would not be lumped in with civilian workers who were injured ’on the job’. When a Canadian worker is injured on the job, the whole of the available provincial medical services are available and come to the aid of the civilian individual. Professor Robinson quotes Michael Gross who asks us to imagine a scenario in which three people suffer identical head injuries two of whom are civilians involved in motorcycle accidents and one a soldier injured in battle. The CAF member who is injured relies upon the CAF Health Service resources. In some cases as in ground combat those resources are scarce. In Afghanistan soldiers injured in battle relied upon their own life saving capability and after the battle was over, that of Combat Casualty Care specialists in their unit to provide additional life saving care. Evacuation from the scene by helicopter to the Role 4 hospital in Kandahar Airfield saved many a wounded soldier from becoming a ’died of wounds’ casualty. Onward evacuation to the US Army hospital at Landstuhl, Germany saved countless other lives. The major difference that seems to have been missed by Michael Gross and Professor Robinson is that in the scenario the two civilians were injured by happenstance and medical care would have been as fast as could be provided. The soldier had no choice but to go into harms’ way knowing that he could be injured and that is the major difference between civilians and military personnel. Just a small note on ‘ opportunity events’ in the area in September. September 25-28/13 a 67th reunion of the First Special Service Force – Devil’s Brigade will be held at Caesar’s Casino in Windsor in the Augustus Ballroom. A number of members from ‘the Branch’ Br 324 Wheatley are attending, me included. The dinner for which tickets are issued- free to veterans, is Friday 27th where there will be approximately 400 service/ex-service personnel in both Canada and the USA. I will go ‘armed’ with applications, and will be in NATO Vets uniform; I specify NATO as there will be a number of R.C.Legion uniforms, and all will be sporting our medals. There is also a parade on Saturday 28th from Dieppe Gardens at the Windsor waterfront to Windsor City Hall Sq. a banquet follows at 1900 Hrs in the ballroom. I will also be in attendance at both of these events. Ralph Mayville, the soul survivor of this unit was in attendance at our Legion Branch on Saturday 31st/8/13. He, along with two of the executive were selling T’s and decals (an incentive) to the event. Comrades All, In recognition or their service, the government of Canada has too current items that Veterans or their families may apply for in recognition of their service. Please let your members know about the availability of these items. Bomber Command Bar - This bar is being issued to eligible Canadian Veterans (or their next of kin) who served in Bomber Command during the Second World War. The honour, in the form of a bar clasp, is to be worn on the ribbon of the Canadian Volunteer Service Medal (CVSM). Below is the link to the online application form, or you can contact the department at 1-866-522-2122 to order. Korean War Certificate - This certificate of recognition is being issued to all eligible Canadian Veterans of the Korean War. Below is the link to the online application form, or you can contact the department at 1-866-522-2122 to order. OSI Connect is a comprehensive learning and self-management tool to assist Canadian veterans and RCMP community with common mental health concerns. Built for iPad, iPhone, Android, and Blackberry, OSI Connect is portable and provides information and assistance at the touch of a button. An operational stress injury (OSI) is any persistent psychological difficulty resulting from operational duties performed during military or RCMP service. It includes a range of health problems such as anxiety disorders, depressive disorders, substance use and Post-Traumatic Stress Disorder (PTSD) as well as other conditions that may be less severe, but still interfere with daily functioning. Recognizing that you need help, and getting the help you need, takes real courage. Check out the details to start feeling better soon. PTSD Coach Canada is a free mobile app that can help individuals and their families manage the symptoms of post-traumatic stress disorder. Developed by Veterans Affairs Canada, in partnership with the Department of National Defence and the Canadian Mental Health Association, PTSD Coach Canada was adapted from the American PTSD Coach, created by the United States’ Department of Veterans Affairs and Department of Defense. It can now be downloaded to mobile devices free-of-charge through the iTunes store and the Android Market. Together with professional treatment, PTSD Coach Canada provides you dependable resources you can trust. If you have, or think you might have PTSD, this app is for you. Family and friends can also learn from this app. PTSD Coach Canada provides you with information and self-help tools based on research. The Canadian Forces Appreciation Program has recently joined forces with International Cruise and Excursions, a company that represents GovVacation Rewards. OTTAWA, ON, April 11th, 2013 – Mr. Gordon Moore, Dominion President of The Royal Canadian Legion, in collaboration with Wounded Warriors Canada is pleased to announce the launch of a national awareness campaign focused on the support services available at The Royal Canadian Legion Branches across Canada. Ottawa, Ontario – Canada’s Veterans Ombudsman Guy Parent released today a report entitled Improving the New Veterans Charter: The Parliamentary Review. Its purpose is twofold: to focus discussion for the fast approaching parliamentary committee review of the enhancements to the Canadian Forces Members and Veterans Re-establishment and Compensation Act, commonly known as the New Veterans Charter; and to act as a catalyst to broaden the review to include a discussion of the New Veterans Charter, as a whole. In preparation for the review, the Office of the Veterans Ombudsman analyzed the more than 200 recommendations for improvements to the New Veterans Charter proposed in various reports since 2006. It found that 145 of the recommendations dealt with three key transition issues: financial instability and decreased standard of living caused by reduced post-release income; limitations in vocational rehabilitation and assistance programs, which can affect second career aspirations and employment options; and difficult family environment situations due to insufficient family support. In the lead-up to the review, the Veterans Ombudsman will continue to meet with Veterans and their families and Veterans’ organizations across Canada to discuss the best way forward on this issue. In coming months he will publish a follow-up paper with specific evidence-based recommendations to address the Charter’s shortcomings in relation to military to civilian life transition challenges. The full report is available online at www.ombudsman-veterans.gc.ca/reports-rapports/reviewcharter01-examencharte01-01-2013-eng.cfm. The March Edition of the CF Magazine MAPLE LEAF has just been distributed today.....and has this NEW article..... on the VETERANS REVIEW AND APPEAL BOARD.... The download the complete March 2013 issue. On March 4th, 2013 Ron Griffis attended a VAC Client Advisory Committee meeting in Halifax. Although there were many items on the agenda, the item below was the only hand-out. It highlights the new VIP system that came into effect Jan 2013. There are a couple of phone numbers within the forms. The Honourable Steven Blaney, Minister of Veterans Affairs, released a report by the Scientific Advisory Committee on Veterans' Health on the issue of depleted uranium titled: Depleted Uranium and Canadian Veterans: A Review of Potential Exposure and Health Effects. The report addresses the subject of the potential exposure of Canadian soldiers to levels of depleted uranium that could be harmful to their health and the overall potential health effects of depleted uranium exposure. Veteran’s Affairs Minister Blaney recently introduced a brand new way to honour those who contribute to the Veterans’ community, through the Minister of Veteran’s Affairs Award of Excellence. The Minister’s Award of Excellence can provide formal recognition to anyone, regardless of their country of residence, as well as to paid employees or groups from various private sector organizations or Governmental/Non-governmental organizations who do exemplary work for Veterans. In this respect it differs from the Minister of Veteran’s Affairs Commendation, which is awarded annually and is intended primarily for Veterans. The first recipients of this award were Veterans who were a part of the legendary Devil’s Brigade. This world-famous First Special Service Force was stood up July 9, 1942 as an elite group of sixteen-hundred Canadian and American men. They fought for ninety-nine days without relief at Anzio, in Italy, and earned the reputation for being able to overcome the impossible. They also suffered many losses. For their bravery, one-hundred and fifty-five Canadians of the First Special Service Force made the ultimate sacrifice, losing their lives in Italy. Minister Blaney, along with Minister Mackay, honored members of the Devil’s Brigade at an intimate ceremony on Sunday February 3, 2013 in Ottawa in the Parliamentary Hall of Honour. A Backgrounder on the Minister of Veteran’s Affairs Award of Excellence is posted on this Scribe for your review. - specifically how you carried on with your NATO Vet functions despite numerous serious medical set backs the last years. We all agree "you deserve this"